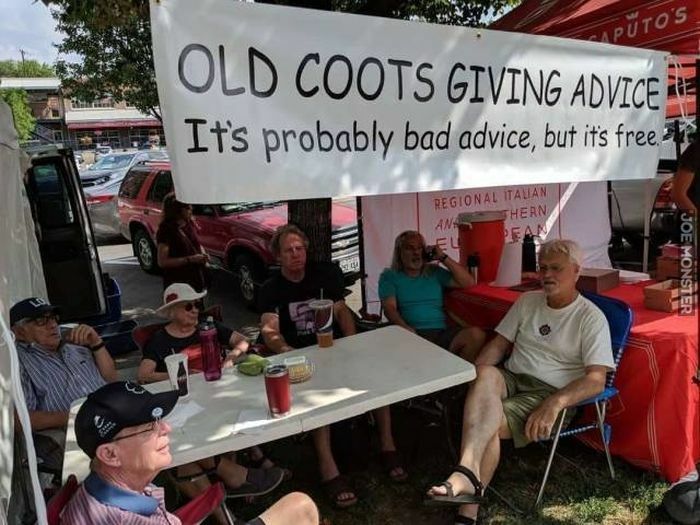 Recently, I saw an image featuring a group of older people at a farmers market who had set up a tent with a sign that read, “ Old Coots Giving Advice. It’s probably bad advice, but it’s free.” The picture made me laugh, but it also made me wonder. What if I went and asked older people for advice and insight on things that us as High Schoolers are going through? What would I ask them? What would they say? I asked my teachers and friends these question and eventually came up with this; I would go to a donut shop, ask the older people there the following questions and then record their answers, and surprisingly, it went quite well. What advice do you have for HS students? How has HS changed since you were a student? Patty: Patty described to me that she had a 1000 kids in her graduating class. At the time, her school was very segregated. “ Coloreds were here, whites were here,” she stated as she pointed from one side to the other. Jerry: “Classes are a lot bigger,” was the first thing he said, “ I had 8 in my graduating class.” He then told me there was 65 kids in his entire High School. Hubert: Hubert stated, “ There is less freedom.” When he was in school kids were allowed to bring weapons on campus. At the time there was no threat in doing so. Hubert described how kids would bring actual guns, with no bullets, to school so they could play cowboys and indians. Times sure have changed. Roy: “Prices have gone up,” Roy stated. Lunch used to be a dime when he was a school. He also voiced that the biggest problem was kids throwing paper wads and that the girls dressed “immaculately”. Jarvey: Branching off the topic of school dress, Jarvey informed me that kids didn’t wear shorts, and the dress code was much stricter. Overall, I thought my little adventure went quite well. The people I interviewed were easy to talk to, although I learned that one has to speak up when talking to this particular crowd. It was a great experience and I plan on doing it again. My inspiration for the article. This is such a good idea for an article. Allie is such a brilliant writer. I’m looking forward to reading more stuff by her. Great job! this is an wesome article !! This was great! I love talking to elders, they always have the best advice and greatest stories! This should be done more often! great advice from these intelligent people. This article and the advice was really good! Very good article really gave me insight to the past! The best advice you will ever get comes from the older generations like they say it might not be good but it is free and you can take that advice and learn and grow with it. Great article. I like the idea of simply asking our community elders for advice or even just listening to their stories. It’s a cool concept (though I’d probably never have the courage). I thought your articles was excellent! I actually saw the “Ol Coots giving advice” myself and wondered if anyone would actually ask them questions. Great Job!! Keep up the good work! 1(It helps me relize that time can go fast pretty quick. I liked the advice that was given. It’s nice to here what the elder think about society today! Its a good article with alot of information can be helpful in the future for alot of people. The article was amazing. I could really tell you worked hard on it. This was a good article the old coot’s give away that really got me. Although they uaslyy give me good advice.I am motived when I out my mind to it. This is such a good idea to write about. Allie is such a brilliant writer. I’m looking forward to reading more from her.